AIS is showing that Princess Seaways is heading to Newcastle Australia, but clearly an AIS fault. Doubt DFDS have sold her. Princess leaves tomorrow for a ship yard. Any ideas where? She was rumoured to be replacing Europe for Jan 2015 at Fishguard. Stena Europe's pax capacity is too high for the route although her freight lanes are less. Malo Seaways/Stena Nordica is longer although narrower but their weight is quite similar. Crown is off to Landskrona and Princess is laid up in Amsterdam. DFDS Princess Seaways departed from IJmuiden to Newcastle. "Dokperiode 2016 KING Seaways - 5 januari t/m 19 januari"
"Dokperiode 2016 PRINCESS Seaways - 20 januari t/m 17 februari​"
Where do you think they will go for refit? I hope in the country where DFDS get their customer's money from: the UK or the Netherlands, but i am afraid Denmark. Being Danish, I would hope Denmark. They fly the DK flag so I don't see why they should go any where else. Last time they went to Gdansk though. Did they both not spend some time in Amsterdam last year? Is there a dry dock large enough for them there or did they stay in the water? The sailing to Gdansk must cost a bit in fuel alone. 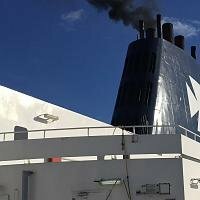 I think P and O and Stena both use Keppel Velrome in Rotterdam for their Dutch ships, Zeebrugge P and O tend to go to the Tyne, good that they're putting some money into British businesses. last time they both went to Gdansk. DFDS King Seaways had yesterday her scheduled sailing from Newcastle to IJmuiden and was yesterday afternoon involved with a safety training. She sailed this morning from IJmuiden tot Amsterdam. Is she refitting in Amsterdam? Poetically, she seems to be moored at the original Tor Line berth at the Coenhaven! 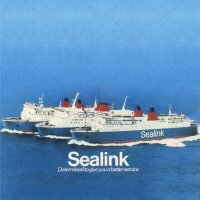 The very roots of the history of the DFDS operation to Ijmuiden. King Seaways is still at the Coenhaven berth. Here's a picture of Tor Anglia sitting in that same berth in 1972. If you look at Google Earth you can see that even the building on the right is still there. Just a provocative thought.....nothing more than that, nothing serious.....wouldn't it be great if what King Seaways is doing there is undertaking berthing trials! Now that would be worth nipping up the A1m for, straight into the heart of Amsterdam. I know that at the grand old age of 40 Tor Anglia was still busy but i can't seem to find anything after 2006? Beautiful ship and her sister too. The precise coordinates are 36°40'52.5"N 36°12'21.0"E and she served as an accommodation ship. She is still visible on Google Earth but sadly was reportedly broken up last year. 49 years, a true testimony to quality. Indeed. The satellite imagery thing is interesting - the satellite coverage on the Apple iPad maps must come from different imagery from Google Earth; I had assumed it was the same source data. But I agree you can see her on Google. The Apple imagery must pre-date the Google imagery quite significantly because it shows the area being a bit of harbour backwater, whereas on Google the whole area has been reclaimed and you can see the former Tor Anglia plonked in the middle of dry land! Fascinating, thanks hhv. Edit: Ok, discovered something I never knew you could do with Google Earth, that you can go back to earlier imagery. Seems that Apple does use Google Earth imagery but that it is way out of date. The picture on Apple is dated as 2008 by Google. The most recent picture, showing the ship on dry land, is dated January 2015, so if she has been broken up then it will have been within the last year. Crown is back to Copenhagen and did not recive a new livery but may have had the Seaways part on the hull removed. Now it's pearl's turn to head off! If anyone has the urge to get a flight to Copenhagen tomorrow both Olso - Copenhagen ships will be in Copenhagen at the same time! DFDS King Seaways now sailing from Amsterdam westbound. Princess Seaways has carried out her service Newcastle-IJmuiden last night. King Seaways seems to be ready for service two days earlier than scheduled. Since some minutes ago Princess and King chanched position in IJmuiden. Should the King do the sailing for the Princess so that Princess goes for docking earlier than the scheduled 20th januar?? ?